Double click an empty area in the calendar view, while an event calendar is active in the Calendar List, to create a new event. Double-click an existing event to open it. 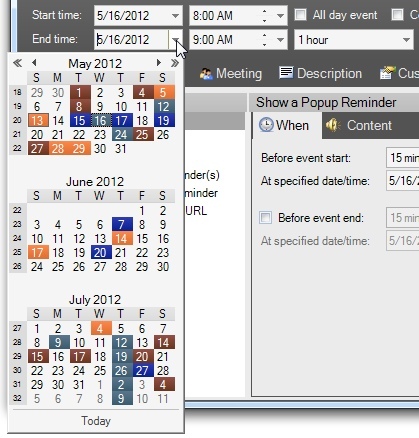 Right-click the calendar view and select a new event command from the popup menu, or the Open Event command if an event is clicked. Create a new event using one the "New" submenu commands on the File menu, or press Ctrl+N. 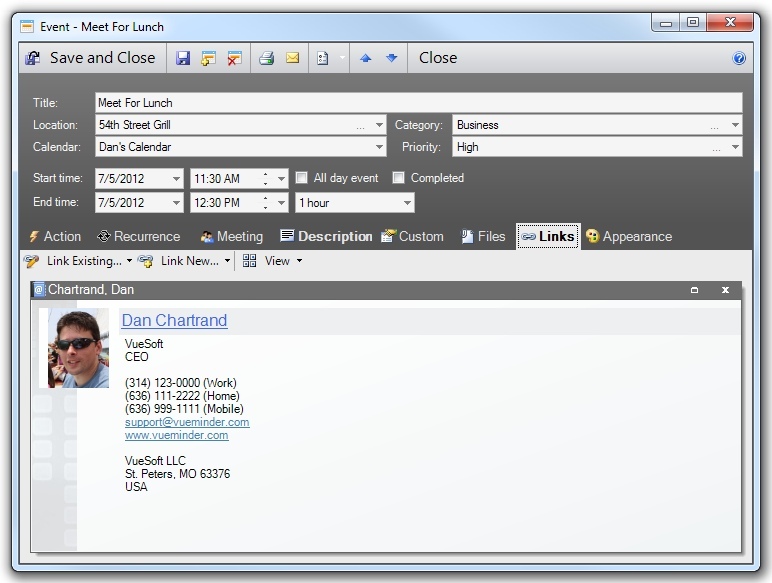 Create a new event for a contact via the right-click menu in the Contact List or the toolbar in the Contact Editor. Create a new event link via the Links tab in the various editor windows. Click the title of an event in the Details pane. Double-click an event in the Upcoming Events area of the Desktop Calendar. Use the Open command on the popup reminder window. Click the event title in a desktop alert. Use the birthday or anniversary toolbar buttons in the Contact Editor. Open a linked event from the Links tab in the Task Editor, Note Editor, or Contact Editor. The Event Editor window enables you to create new events or modify existing ones. When you create a new event, the following window will be displayed. The initial/default values will be different, based on your options, the Calendar Properties, and the active calendar name. This window will also be displayed when opening an existing event, enabling you to view or modify any of the event's parameters. Tabs are displayed enabling modification to the event actions, recurrence settings, meeting attendees, description, file attachments, links to other items, and appearance. If any data or settings have been entered on a tab, the tab's name will be bold to indicate data is present. Basic information about the event, such as its title and date, is displayed at the top of the Event Editor window. When the Event Editor is initially displayed, focus will be placed on the Title field, where a descriptive title for the event may be entered. You can press Enter after typing the event title (while input focus is still in the Title field) to save and close the event. The event's title will be displayed in the Calendar View and Event List. It will also be displayed in the Details Pane when the event is selected. The title does not need to be unique and there is no limit to its length. When an email reminder is sent for an event, the email subject will be the event title. An optional location may be entered for the event. After specifying a location for an event, the location will be added to a drop-down list. You can select a previously entered location, rather than typing it in again, by selecting the location from the drop-down list. This list is accessed by clicking the drop-down arrow on the right side of the Location text box. The location will also be displayed in the Calendar View, depending on the view settings. The event will belong to the specified calendar. Clicking the drop-down arrow will display a list of all event calendars. You can type a different calendar name to add the event to a new calendar. The calendar will be created after closing the Event Editor window. When opening an existing event, you can use the Calendar field to reassign the event to a different calendar. When reassigning an event to a different calendar, a window will be displayed asking if the default properties of the destination calendar, such as the category and reminder settings, should be applied to the event. This field is disabled when an occurrence of a recurring event series is opened, since individual occurrences can't be assigned to calendars that are different than the calendar used by the rest of the series. Events can be associated with zero or more categories. To associate categories, place checkmarks in the desired categories, accessed from the Category drop-down list. You can also create, delete, or rename categories by clicking the "..." button. This will open the Category Editor window. Events can be assigned a priority. To select a priority, click the drop-down arrow and pick a priority name from the list. If a priority is not desired, select "None". The list of defined priorities can be modified by clicking the "..." button. This will open the Priority Editor window. Up to 10 priority types can be defined. Check this box if you'd like to mark the event as completed. Events can also be marked as completed by using the associated checkboxes in the Event List. Completed events will be faded (semi-transparent) when displayed in the Calendar View. If the Hide Completed Events option is selected from the View menu, completed events will be hidden from display in the Event List and Calendar View. The start and date can be selected from a drop-down calendar or typed in using the keyboard. The drop-down calendar will show color-coding for each day, similar to the Month Navigation Pane. Also, you can see what activities occur on a date by hovering the cursor over the date for about a second. The event's beginning and ending date and time can be specified. Events can be all day, span multiple dates, or have starting and ending times. If "All Day Event" is checked, the event will last all day and the starting and ending times won't be displayed. All day events can still span multiple dates. They will be all-day events on each day. The starting and ending times can be selected from the drop down list. If the desired time isn't available from the drop-down list, you can use the keyboard to type in a time (example: "1:50 PM"). The up/down arrows can also be used to increment or decrement the time by 5 minute intervals. The event duration shows how long the event lasts. It can also be modified to adjust the event ending time, or vice versa. Duration values can be selected from the drop down list. If the desired duration value isn't available from the drop-down list, it can be typed in (example: "1.3 hours"). The minimum duration for an all-day event is 1 day. The minimum duration for a non all-day event is 1 minute. Note that the ending date and time must come after the starting date and time. If they do not, the starting date and time will be automatically adjusted. A toolbar appears at the top of the Event Editor, providing a number of commands. Save And Close - Saves the event and closes the editor window. The keyboard shortcut is Ctrl+S. Save - Saves the event but leaves the editor window open. Save and New Event - Saves the event and creates a new event in the same editor window. The keyboard shortcut is Ctrl+N. Delete - Deletes the event and closes the editor window. The keyboard shortcut is Ctrl+D. Print - Prints the event details. The keyboard shortcut is Ctrl+P. Email - Initiates a new email using your default email program. The body of the email is initialized from the current event. The keyboard shortcut is Ctrl+E. Defaults - Expands in to a submenu for saving the current event data as the default for new events belonging to the same calendar, or loading the associated calendar's defaults, which will override the current settings. Previous/Next Event - Saves the current event and opens the previous or next event in the same editor window. The next or previous event is found by using the date and time of the current event and searching backward or forward in time until another event is found. The keyboard shortcuts are Alt+UpArrow and Alt+DownArrow. Close - Closes the editor window. If there are unsaved changes, a message will appear asking if those changes should be saved first. The keyboard shortcut is Alt+F4. Help - Displays this documentation. The keyboard shortcut is F1. The "Event Defaults" button enables the currently specified action settings, as well as the description and other basic information, to be saved as the default for any new events that are created belonging to the same calendar. This is equivalent to modifying the event default under the Calendar Properties, but is a convenient shortcut. You can also load the default settings and assign them to the current event. A list of available actions is shown on the Action tab of the Event Editor window. Actions can be enabled or disabled using the associated checkbox. Actions that have already been performed will be indicated with gray checkmarks. The following event recurrence types can be specified on the Recurrence tab when the "Recurring Event..." box is checked. Each recurrence type provides a number of additional options to customize the event recurrence exactly the way you want. You can also specify a date range or maximum number of event occurrences using the Recurrence Range controls. The Meeting tab can be used for sending the event as a meeting request to any combination of individual contacts, distribution lists, or contact groups. This tab will be automatically enabled when "New -> Meeting Request" is commanded from the File menu. It can also be used to convert an existing event into a meeting request. To define a meeting request, click the checkbox on the Meeting tab and specify the required and optional attendees. If you'd like to initiate the meeting request on behalf of someone else, check the "Have replies sent to" box and enter their email address. Any meeting responses will be sent to that email address instead of your own. You can specify individual contacts to receive the meeting request. When clicking this field, a drop-down list of contacts will be shown. Use the checkboxes to select the desired contacts. If you need to add a new contact, click the "..." button to access the Contact Editor, where a new contact can be defined. The meeting request can be sent to one or more distribution lists. To select the desired distribution list(s), click the drop-down button and use the checkboxes. If you haven't defined any distribution lists, or if you'd like to view/modify existing distribution lists, click the "..." button. A menu will appear enabling creation, modification, or deletion of distribution lists. 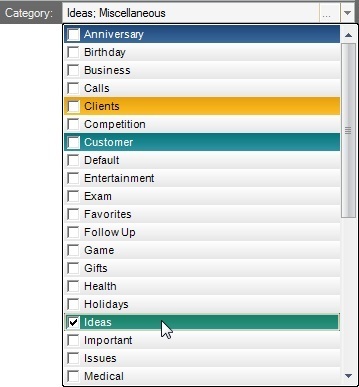 The Contact Editor contains a "Group/category" field. If this field is used, you'll see a drop-down list of the currently used contact groups. Use the checkboxes to select the desire contact groups. This can be used as an alternative to distribution lists. Any contacts associated with the selected group(s) will receive the meeting request. When the event is a meeting request, the "Save and Close" and "Save" buttons on the toolbar at the top of the editor window are renamed "Send and Close" and "Send". When either of these buttons are clicked, the meeting request will be sent via email to the specified attendees. Note, before this will work, your email settings will need to first be specified. Required attendees will be on the "To" line of the email, and optional attendees will be on the "CC" line. If you make changes to an existing meeting request, you can use the Send button to send the meeting attendees the updated meeting information. If you add additional attendees to a meeting request, but make no other changes, the Send button can be used to only send the meeting request to the new attendees. Also, if you later delete the event, a meeting cancellation notice can be sent to the attendees. 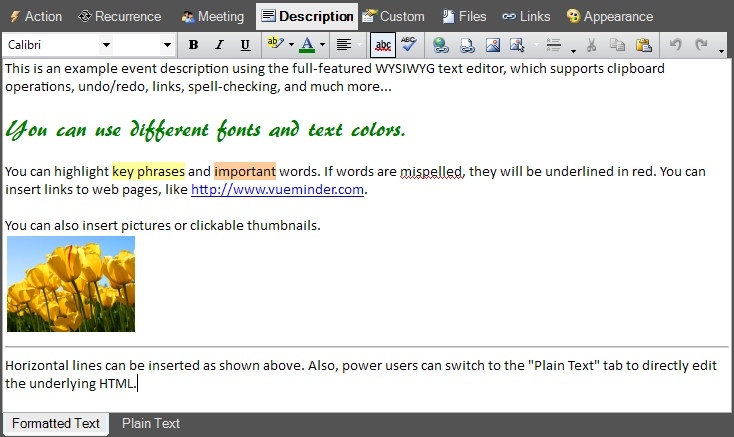 An event description can be entered on the Description tab using a full-featured text editor. 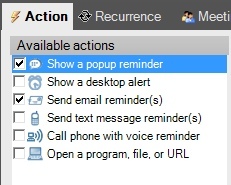 If a popup reminder is configured to show the event's description, this text will appear in the reminder window. If an email reminder is sent, this description will be included in the email. This description will also appear in the Details Pane when the event is selected, as well as the event's tooltip when hovering the mouse over the event in the Calendar View. If the description contains links to web pages or files, those links will be clickable in the Details Pane. You can also hold the Ctrl key while clicking a link in the description editor to open the link. The editor also supports drag-and-drop, so you can drag files or pictures from Windows Explorer into the description tab. 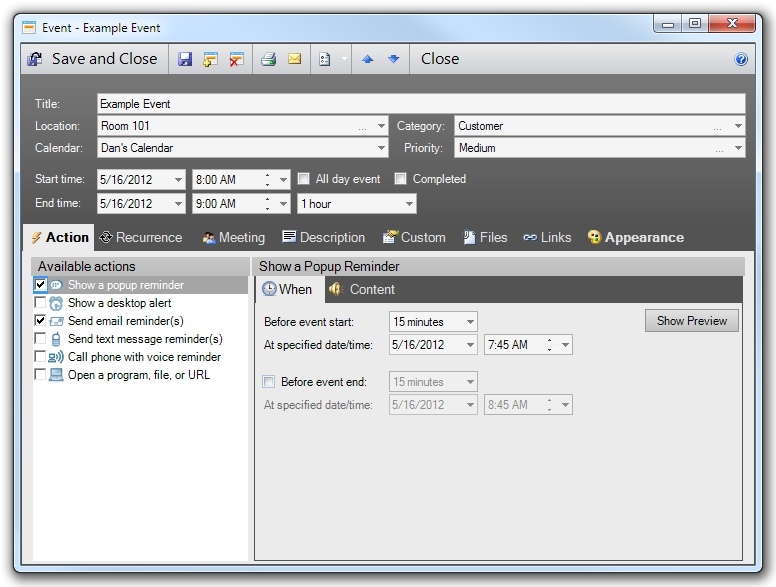 VueMinder Ultimate provides the ability to define custom data fields for events via the Custom tab of the Event Editor. Custom data can also be imported or exported, and will sync over a local network when using VueMinder Server. See the Custom Data documenation for more information. Any number of file can be attached to the event (as links), using the Files tab. If a popup reminder is configured to show the event's description, linked filenames will appear in the reminder window. The files will also appear in the Details Pane when the event is selected. Files can be opened from the Files tab by double-clicking or using the Open command on the toolbar and right-click context menu. More information can be found here. Events can be linked with other events, tasks, notes, or contacts by using the Links tab. When a link is created, it becomes 2-directional, meaning a backlink to the event will be automatically added to the linked item. Linked item details will be shown on the Links tab. For example, when an event is linked to a contact, the Links tab will show the associated contact's email address and phone number. More information can be found here. The appearance tab enables a custom appearance and/or day background to be specified for the event. The custom appearance will override any associated calendar, category, priority, or location appearances. To reset a customized appearance, click the "Reset Appearance" button, or uncheck the appearance override checkbox. More information can be found here.